Many people do not want to try out smoking meat because it’s an expensive prospect. And if splurging on a new smoker worth few hundred to over a thousand was not enough, you have to spend time learning how to use this equipment. Masterbuilt is known for making some of the top smokers out there today. These machines allow users to use pellets, wood chips, and similar materials to not only cook your foods but also add smoke flavor to them. With model using on electricity, there’s no need to keep an extra tank of propane to come in handy when you run out of fuel. Plus, the company comes in a wide range of model and styles to fit both your needs and budgets. Here’s a compiled list of the top 8 best Masterbuilt electric smoker reviews to help choose the best appliance. This model comes with a viewing window to watch how your chicken, turkey, etc. get smoked into delicious food. Although, it adds to a pile of things you need to clean before or after eating, which is stressful. However, this model comes with everything you need to get your food ready precisely as you want it. 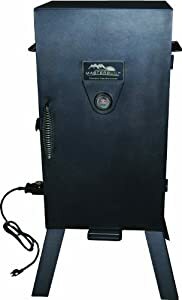 The Masterbuilt Front Controller Smoker is 40 inches, which makes it perfect for large families or those who often have friends and family over for a weekend. It’s capable of holding four pork butts, 24 burgers, 24 sausages, four racks of ribs, two whole turkeys, and 12 whole chickens. 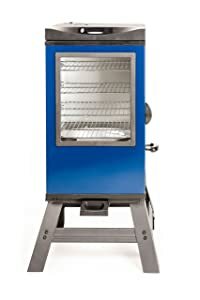 On top of that, it comes with a patented loading system, allowing users to add wood chip from the side without having to open the smoker door. Plus, it features an RF remote and digital panel control, which makes it possible for a user to sit back and monitor the internal food heat, control temperature, light, time and ON/OFF. 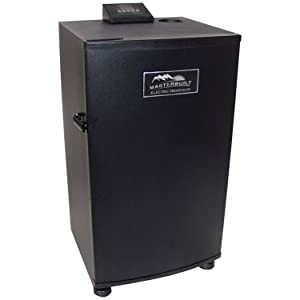 The Masterbuilt 30” Electric Digital Smoker is an affordable smoker that provides both newbies and professional a chance to make high-quality smoked foods. Whether it’s frying a turkey or filleting a fish, this product offers a high-quality smoking experience. This model comes with a number of options to pick from, with a top controller and no window being the most basic model. However, for a few bucks, you include a front window, which I find not very practical. Frankly, there’s nothing special about watching the food get smoked, and at the end, it just adds to the list of parts that needs to be cleaned. Further, this appliance is capable of holding two whole turkeys, 12 whole chickens, four racks of ribs, 48 sausages, 24 burgers, and four pork butts. With the RF remote and digital control panel, users can just set the temperature and time to get the food smoked with high precision for the best taste. More so, you can not sit back and make use of the remote to regulate the smoker temperature, internal meat temperature and cook time. This feature makes it easy to achieve a competition-ready result without much hassle. This appliance is another top-notch model from Masterbuilt coming with three smoking, which allows slow smoking to be as easy as grilling. This unit is constructed to make smoking hassle-free with the featured thermostat temperature control. The built-in thermometer makes sure you are cooking at exactly the perfect temperature; meaning your chances of overcooking your meat is limited. 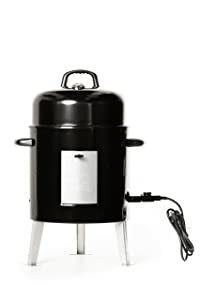 Masterbuilt Black Electric Analog Smoker comes with a water pan and wood-chip tray for delicious food with a yummy smoke flavor. What’s more? With a removable drip pan, cleanup is a breeze. 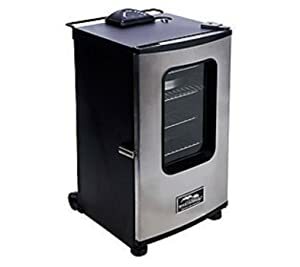 This 30-inch Smoker comes with a wide range of cooking temperature from 100 degrees Fahrenheit to 400 degrees Fahrenheit. If you are looking for a portable electric smoker perfect for road trips, tailgating, and camping, then this model is a go-to. This appliance comes with four legs; anyone can easily fold for easy storage and transport. That’s not all: it comes with a 1,400W heating element with two smoking racks coated with chrome to ensure you get that ideal smoke flavor. Also, this model makes sure your juicy food is not overcooked and at the right temperature, with its simple temperature controls – low, medium, and high. Further, the temperature gauge on the door is designed to be read easily. Plus, it comes with a removable water pan and wood chip tray. The water tray does not sit right for some users. This model is an ideal choice for both beginners and professionals. 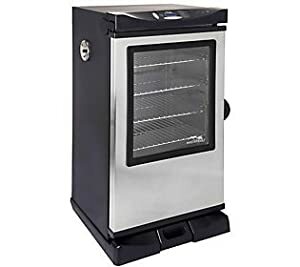 This Digital Electric Smoker features an 800-watt heating element that provides your foods with even, consistent smoking with temperature as high as 275 degrees Fahrenheit. More so, this unit comes with four chrome-coated smoking racks that are capable of holding 80 lbs. of food. Featuring RF remote to control the smoker’s food light, ON/OFF, time, temperature, and monitor your food temperature. Further, it’s designed with four legs to add 10-inches of height making it easy to access your meat. What’s more? Masterbuilt 4-Rack Digital Electric Smoker includes carving gloves, smoker cover, and 25-recipe cook booklet with lots of smoking dishes. This product earns a spot on our top 8 Masterbuilt electric smokers, with its 1650W heating element to ensure even and consistent temperature. Similarly, it does not require propane or charcoal to get your meat juicy with a smoke flavor. Similarly, using this unit is very easy. All you have to do is place your meat on the grill, choose your preferred temperature, and sit back and watch your juicy food get ready. Thanks to its simple temperature setting allow you to smoke and grill your food to perfection automatically. Coming with a wet chip tray to help make cleaning a breeze by collecting the ashes and a water bowl to ensure your meat have the ideal moisture and taste. Plus, it’s cooking space is about 395 sq. Inches which make more than enough for most outdoor events. The Masterbuilt Digital Electric Smoker comes with a radio frequency remote control to perform a number of functions without having to stand up: internal light, time, temperature and ON/OFF. The manufacturer has built this model to offer easiness; thanks to its built-in handle and wheel, which make moving this unit around less challenging. 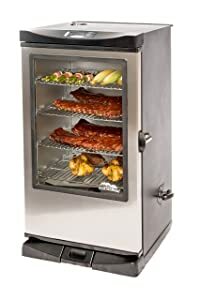 The Masterbuilt 30 inches Digital Electric Smoker features a viewing window allowing you to monitor your food easily, a fully insulated body to prevent heat loss and four chrome cooking racks. Also, it comes with a side loading system that allowing you to add wood chip keeping the flame going. Furthermore, this model comes with a built-in meat temperature probe that ensures you never overcook your meet. On top of that, it comes with a top air damper and a removable drip pan. 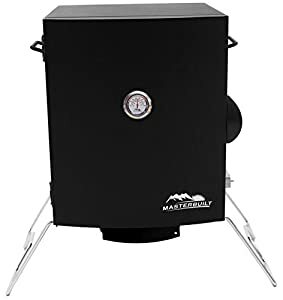 Lastly, featuring Masterbuilt 30 inches Cover, you can rely on this product to have a long-lasting smoker through sun, snow or rain. For those who love their food with a delicious smoky flavor, this appliance offers just that. From drunken ribs to seafood, sausages, chicken, side dishes, and more, it comes with all necessary thing to achieve the best barbecue cuisine. The Masterbuilt Platinum 4 Rack Electric Smoker comes with an interior cooking surface about 730 sq. Inches, which is ideal for family-sized meals. More so, it features four removable racks to offer extra storage space allowing you to cook up enough mouth-watering meats for all. This model is engineered to stand the test of time, and features a window to monitor your meal and ensure they are perfectly cooked. Here’s more: coming with a built-in meat temperature probe and integrated control ensuring your food is precisely cooked at you want it – juicy or dry. Users can take advantage of its rib racks, sausage hangers, and drunken chicken stand to make your favorite dish without hassle. Also, its carving gloves help protect your hands as you serve up the ready-cooked meal to friends or family. Lastly, it includes a recipe CD, which packs lots of new favorite dishes to help make one of them for a lovely meal.